After her son was born, Carrie’s life was turned upside down when he almost didn’t live. 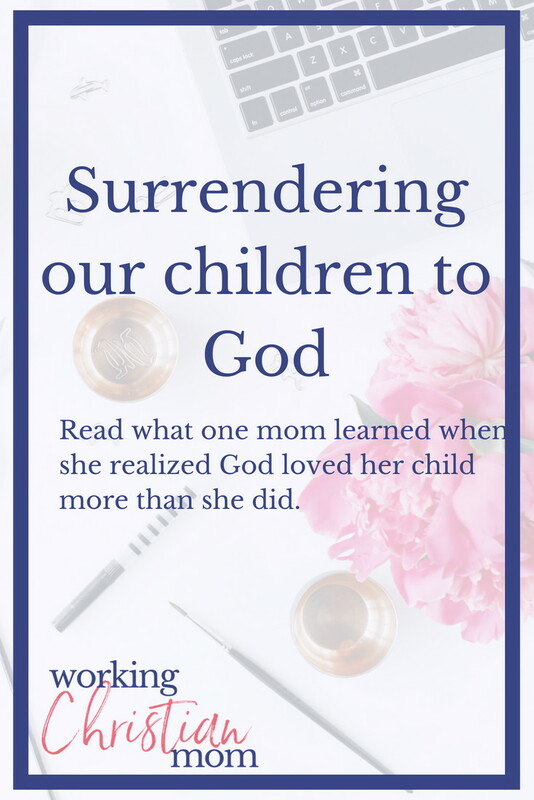 She shares with us the lessons she learned from surrendering our kids to God. 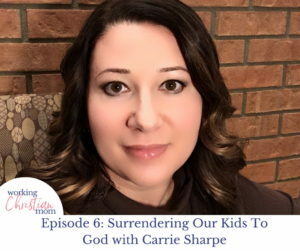 God loves our kids more than we love our kids and in this episode of the Working Christian Mom podcast you’ll hear Carrie’s story of surrender. How God showed up in the middle of a major crisis with one of Carrie’s sons. 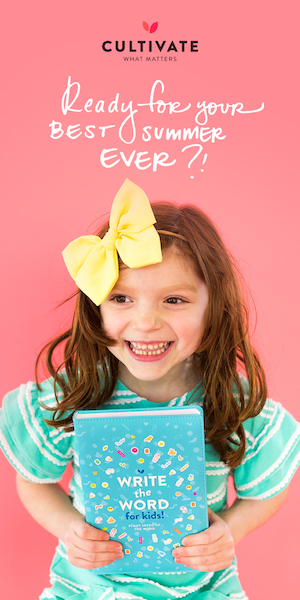 What happened when Carrie fully surrendered the life of her child to God. How Carrie and her husband were able to keep the lines of communication open between them, even through their world seemed to be falling apart. What it is like to go through conceiving another child after you almost lost one. How Carrie is able to run her home, run her business, homeschool her children and keep up with everyone’s extracurricular activities. How Carrie feels about her kids becoming big kids and learning how to drive, getting ready to leave for college, etc. Here are three great things we learned from Carrie during this conversation. If you need something from your spouse, communicate it to them! Carrie and her husband Ryan aren’t afraid to speak up when they need something from the other. Instead of tip-toeing on egg shells, they make sure to communicate their needs, wants and desires. They are upfront and honest with each other and that great communication came in handy when they faced a crisis with their son. Even in the middle of crisis, God is still there with us. God doesn’t leave us or forsake us, even in the middle of something huge. He sticks right with us, reminding us of his love and showing up in big ways and in small ways. And he loves us and our kids more than we love our kids. God reminded Carrie that He was with her during her crisis through a song on the radio- a song that wasn’t played often (not a top 40 hit) that came just at the right time. That song for Carrie was He’s My Son by Mark Shultz. Self-care doesn’t have to mean getting massages or mani-pedis. Carrie mentioned that for her, self care involves rest, quiet time and relaxation. She needs a bit of alone time to recharge so she can serve her family best. She is really dialed in to what she needs and has made sure to let her husband know, so he can help her to take care of herself. About our guest: Carrie Sharpe is a Communication Consultant, Speaker, and Co-Owner of He says, She says. She earned her degree in Political Science and Psychology from Lake Superior State University. A highly sought-after international speaker, Carrie develops courses and coaches clients in communication and public speaking skills. Carrie is a Huffington Post Contributor and has been quoted in a variety of publications including LiveStrong, Forbes, Business Insider, and Bustle. She resides in northern Michigan with her husband, Ryan, and their five children. She homeschools her children and works from home. (Save this to your Pinterest so you can come back again and reference it if you need to). 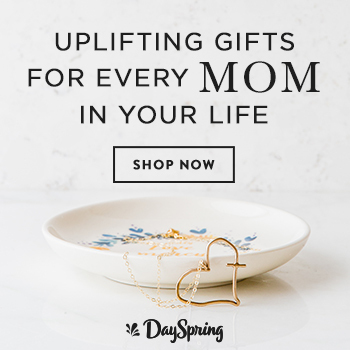 Submit your email to the right to grab our free 7 day Battle Cry Guide devotional.